On a night that featured the deepest preliminary card in Bellator history, only the main event would see a finish on Bellator 210’s main card. In the main event, middleweights Chidi Njokuni and John Salter would face off looking to jockey for position at 185 pounds. Njokuni looked to stay undefeated at middleweight, after missing weight in his last two fights at welterweight, would walk into a heap of trouble against Salter. Towards the end of round one, Salter would get Njokuni to the ground, take the former welterweight’s back and lock in a rear naked choke with less than a minute in the opening round. Salter walked into the Bellator cage looking to wash away his loss to Rafael Lovato Jr. at Bellator 205, and would do so with his fifth submission victory inside the Bellator cage. With the win, Salter would tie for second all time in company history in submission finishes. “I knew I could stand and survive, but I knew I couldn’t dominate there,” Salter said to Chael Sonnen after the fight, claiming who ever they put in front of him next, he’d take gladly. Welterweight: David Rickels def. Guilherme Vasconcelos via unanimous decision. Featherweight: Juan Archuleta def. Jeremy Spoon via unanimous decision. Women’s Flyweight: Kristina Williams def. Bruna Ellen via unanimous decision. Costello van Steenis def. Chris Honeycutt via split decision. Jordan Young def. 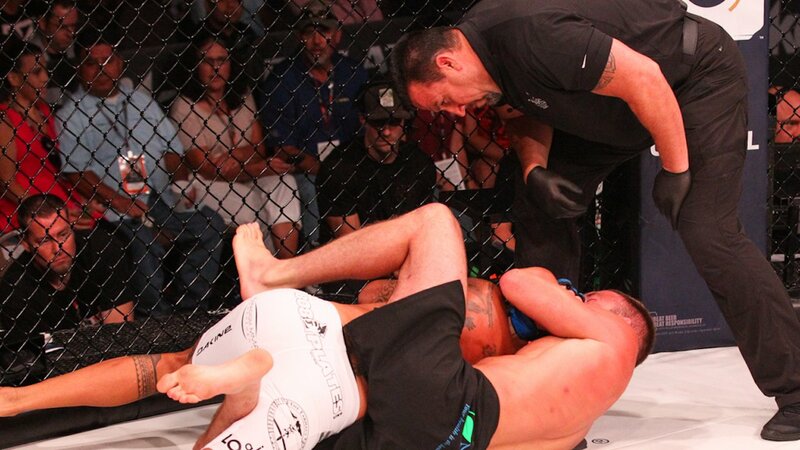 Anthony Ruiz via submission (rear-naked choke) at 3:48 of Round 1. Goiti Yamauchi def. Daniel Weichel by split decision. Joe Schilling def. Will Morris via TKO (corner retirement) at 5:00 of Round 1. Shawn Bunch def. Joe Warren via TKO at 1:42 of Round 1. Mike Shipman def. Scott Futrell by submission (D’Arce choke) at 2:58 of Round 1. Noad Lahat def. Brian Moore by unanimous decision.